All those interested in participating in or getting additional information on Branson’s first “Hand in Hand Branson Honors Purple Heart Recipients” event, to be held on April 24-25, are invited to attend a press conference/meeting at the Hamner Barber Theatre at 2:00 p.m. on March 3. Marlyce Stockinger, Special Veteran Events Coordinator for the event’s sponsor, Branson.Com, said the primary purpose of the press conference is to outline the activities of the two day event, introduce key event participants, and answer any questions about the event the public press may have. Another purpose Stockinger said, was to let the public know how they can participate in remembering and honoring the sacrifices of those who have been wounded in action in the defense of our country and have received the Purple Heart. She points out that this event is a first of its kind in the nation and that although none of the event’s activities will cost the Purple Heart recipients anything, the active participation of the community in attending and participating in the activities will be a vital element in honoring them. She particularly encourages public participation in the Opening Ceremony at the Hamner Barber Theatre at 2:00 p.m. on April 24, the Entertainment Show at the Hamner Barber theatre at 2:00 p.m. on April 25 and, especially at the special “Mountain Majesty Twilight Ceremony,” to be held at Branson Landing at 6:00 p.m. on April 25. Discover the “Diamonds” in the Ozarks – What Can We Become? All residents of Stone and Taney County are invited to come and let their voice be heard at this very important and defining Ozark Mountain Community Town Hall meeting. “What will be our Legacy in Ozark Mountain Country?” If you have ever asked yourself this question, then now is the time for you to come and speak into our area’s core values and future together as we move forward in these uncertain times. Citizens from all across Stone and Taney County are invited to gather at the Tri-Lakes Center, located on Hwy 248, March 6th, from 5:00-7:00pm for a Community-wide Town Hall Meeting, as we “Discover the Diamonds Together”. Attendees will hear the vision for the Ozark Mountain Legacy Initiative and will be invited to actively join in the “Legacy” process by answering survey questions and participating in small group discussions. Community Leaders from across the Ozarks will be present to speak and to “hear” what the citizens of Ozark Mountain Country have to say. Local area citizens initially invited community leaders from several Ozark Mountain cities to help develop and lead this cooperative effort in our region. These leaders include: John Baltes (Silver Dollar City Foundation), Howard Boyd (Branson Hills Pastor), Larry Cline (Rockaway Beach Mayor), Steve Erixon (Skaggs Hospital CEO), Doug Hayter (Branson City School Superintendent), Sue Head (College of the Ozarks – First Place), Jack Herschend (Herschend Family Entertainment), Dean Kruithof (Branson City Administrator), Mike Mason (Reeds Spring Superintendent), Gail Myer (Myer Hotels), David Oliphant (Forsyth Mayor), Chuck Pennel (Taney County Commissioner), Raeanne Presley (Branson Mayor), Jory Rolf (AIM International/Make Believers), Ross Summers (Branson Chamber President) and Rick Ziegenfuss (Hollister City Administrator). For more information go online to: www.ozarkmountainlegacy.org. Please RSVP for the March 6th Legacy Town Hall Meeting by contacting Jory Rolf at: 334-8001 or email us at: rsvp@ozarkmountainlegacy.org. Parents of young children are invited to a FREE infant safety and CPR Class at Skaggs Regional Medical Center. Because CPR is a skill that must be practiced, it’s wise to repeat a course at least every 2 years to maintain your skills. Repeating the course also allows you to learn about any new advances or discoveries in CPR techniques. According to the Center for Disease Control, more than 850 children died in 2001 from unintentional airway obstruction injuries. Of these children, 87% were ages four and under. Learn how to protect your children, Monday, March 2, in the Redbud Conference Room at Skaggs Regional Medical Center. If the class is full, call the Family Birthing Place; arrangements to hold an additional class can be made, (417) 335-8995. After facing tremendous obstacles in their lives, the women and children of The Hiding Place Ministry will get a fresh look thanks to the generous members of the Tri-Lakes community and Pure Salon and Spa in Branson. Area residents are asked to bring in any unwanted hair care products to be donated to The Hiding Place Ministry, where victims of abusive relationships find refuge and support thanks to the tireless efforts of CEO/Director Carolyn Daniel. Any person donating used or newly purchased products will receive a $10 gift voucher for Pure Salon, located at 1077 Branson Hills Parkway in front of the Wal-Mart Supercenter. Donations will be accepted from February 16th to March 9th. Pure Salon owner Rhianna Presley and staff will present the donations in loving memory of Rachel Fair, a friend tragically taken in a January auto accident. Rachel’s open heart and giving spirit lives on through these donations. In addition to the donated hair care products, members of The Hiding Place will enjoy a complete makeover thanks to the stylists at Pure Salon. Burnett moved to Branson about four years ago and was in the Hank Williams Revisited Show, moving to his own show entitled Cash and Friends. Not wanting to be pegged as an impersonater, he started doing his own music and traveled across the South playing fairs and theatres. “I don’t want to make my living off of someone else’s songs. I am my own entertainer and apparently, the folks across the ocean agree,” said Burnett. “Twenty times a day for 365 days straight is proof, and it looks as if I’m going overseas this year on an European tour. Burnett has his own record label entitled AWE STRUCK Records and his wife has a publishing company. Burnett’s new album, “The Money, The Gun, and The Bible” will be released this spring. “I’d rather sit on my porch and play my music than sing someone else’s songs on a big stage in front of a big crowd,” said Burnett. Burnett is also a singer and songwriter. Mickey Gilley holds the record for the most repeat guest star appearances on the Lucas Oil sponsored Gene Williams Country TV Music Show and was the choice as the guest star to be featured on the ‘Best of…’ wrap-up on the Telly Award-winning show. “My friend Mickey Gilley has supported me for going on eight years I have been doing my show in Branson, even substituting as a host. He is a welcome guest star on my country show and appears at least twice a year as a guest star. Because of Gilley, country music joined the mainstream. He has had 17 number-one hits including Stand By Me that he performs on this broadcast,” said Williams who is the star, producer and creator of the Gene Williams Country Television Show that is seen across the nation. The show with Gilley will be telecast Feb. 21 and 22. In addition to nationwide, the Gene Williams Country Television Show can also be seen in Canada. The next live taping of the Gene Williams Country TV Show is Sunday, March 8, at 2 p.m. at the 50’s at the Hop Theatre located in The Shoppes at Branson Meadows. Admission is free and the doors open at 1 p.m. For more information go to the website genewilliamscountry.com. Williams began his country music television show in Arkansas almost 50 years ago and for the past eight years has taped the show in Branson live before a studio audience. Guests have included Ed McMahon, Mickey Gilley, the Oak Ridge Boys, Roy Clark, Johnny Lee, Barbara Fairchild, Sons of the Pioneers, the Osmonds, Johnny Cash’s band The Tennessee Three, the Blackwood Brothers, Helen Cornelius, Leona Williams, Charlie Louvin, Mary Lou Turner, Cal Smith, Stonewall Jackson, Norma Jean, “Diamond” Dave Somerville, Little Jimmy Dickens, Porter Wagoner, Jim Owen, Buck Trent and Wanda Jackson. Williams’ co-host Katie Lynn has received the Branson Entertainment Awards Best Support Vocalist twice for her work in the “Mickey Gilley Show.” She has worked with Gilley for more than eight years and also worked with Jim Owen for seven years. In addition to her singing career, she is a real estate agent. She and the guest stars perform weekly on the television show with the Country Junction Band. A road named after him by his hometown Dyess, Ark., following a 2007 key to the city presentation and a historical marker recognizing for his support to help preserve the town’s history. A historical building in Dyess will be a museum recognizing former residents, Johnny Cash, Tommy Cash and Williams. Grand marshal in the first Dyess Christmas Parade 2008. A Gold Record presented by fans for the #1 classic country music show in America. Key to the city of Horseshoe Bend, Ark., for his work to bring significant country entertainment to the resort community during its early development and April 11, 2009, is Gene Williams Day. Holds a record in Arkansas of having nine days proclaimed Gene Williams Day. Presented an honorary doctorate in television and broadcast communications from St. Martins College for his community commitment to the industry. Honored by the states of Arkansas and Missouri for his work in tourism, entertainment and community. Gene Williams display at the Branson Entertainment Hall of Fame Museum. Nominated for induction into the Arkansas Entertainers Hall of Fame. Has worked with such greats as Johnny Cash, the Carter Family, the Statler Brothers, Carl Perkins, Charlie Walker, Charlie Louvin, Del Reeves, Merle Haggard, Ray Price, Minnie Pearl and Jack Greene. Made two movies: “Country Music Jamboree” and the “Sound of Country Music” that starred more than 39 Grand Ole Opry stars. Come in and enjoy a great meal & 25% Off. Every Friday & Saturday 11:00 a.m. to 8:00 p.m.
Discount is valid with proof of residency or a valid check stub from Stone, Taney or Boone Counties and is not valid with any other discount or offer. Special guest singer Helen Cornelius from Nashville will join The Missouri Boatride Band as entertainment for the Branson Daybreaker Rotary’s 5th Annual Chili Cook-Off on Saturday 21st, 4:00p.m. – 7:00p.m., at the Lions Club on East Hwy 76. Helen Cornelius is a country singer-songwriter and actress, best known for a series of hit duets with Jim Ed Brown, many of which reached the U.S. Country singles top ten. The duet, “I Don’t want to Have to Marry You” was a major success in America. Cornelius will perform from 5:30 – 6p.m. The Missouri Boatride Band will perform bluegrass and comedy for all to enjoy from 4:00 to 5:00p.m. The well-known area band plays everything from classic bluegrass like Bill Monroe’s, Blue Moon of Kentucky, to classic rock tunes such as the Allman Brothers, Midnight Rider, plus bluegrass gospel. The group also add some comedy to the show with jokes and tall tales. Competing for the best chili will be Daybreaker Rotary Club’s past presidents, Glen Cameron, Tony Espey, Jerry Haefeker, Bob Huels, June Kerr, Ron Martin, and Bill Rohlfing. At this years event two Rotaract teams from the College of the Ozarks will also compete. Only ONE can win the favor of the judges! Celebrity Judges (Helen Cornelius, Doug Kissinger, John Spencer, Steve Weyher, David Tate and Frank Woods) will be voting at 5:00p.m. All who partake of the chili will have the opportunity to vote. Individual Ballots along with Celebrity Judges ballots will be counted and the winner will receive the Rotary’s Chili Cook-Off Traveling Trophy. Joan Westfall, Director of Christian Action Ministries (CAM), is excited that the Branson Daybreakers Rotary Club’s event will benefit the CAM Food Pantry. “We need all the assistance we can get during this time”, said Westfall. In 2008 CAM services provided food assistance to 4,376 families (11,686 individuals). More than 400 families have received food assistance in January, 2009, continued Westfall. 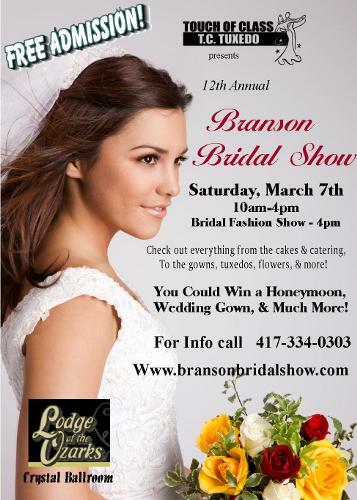 Original art work and jewelry, a Helicopter Pilot Program, a special breakfast for 5, $185 in dental services, and a $100 savings bond, are among the more than 25 items for the silent auction, plus Lynn Windle’s famous pies will be auctioned off at the Branson Daybreaker Rotary’s Chili Cook-Off-Bluegrass and Comedy event. Don’t miss the event on Saturday, February 21st from 4:00p.m.-7:00p.m. at the Lions Club building on E. Hwy 76. Tickets are $5 for individual or $15 for a family. Children 10 and under are free. Tickets are available from Branson Daybreakers Rotary club members, at CAM, or at the door. Allen Smith of SGN Scoops Digital, home of the Diamond Awards, is proud to announce the hosts for the 2009 Diamond Awards program. This year’s awards program will be hosted by Kelly Nelon Clark and Johnathan Bond. Kelly Nelon Clark is one third of the award-winning trio The Nelons. The Nelons’ accomplished musical career and ministry includes six Dove Awards, three Grammy Award nominations, a prestigious New York Film Festival Bronze Award, numerous Singing News Fan Awards, and multiple #1 songs. The group released their worship album – You Are God – last year. Johnathan Bond is no stranger to the Diamond Awards stage. Bond has co-hosted the Diamond Awards for several years. He ministers with his wife each week as a part of the popular duo Young Harmony. The group’s current release is titled Johnathan & Ginger. The online ballots are now available for the 2009 awards program through the Diamond Awards home on the web. The online ballot is designed for fans to nominate their favorite artists for each award. Fans and industry supporters are encouraged to visit the Diamond Awards website to place their votes. The Diamond Awards home on the web is located at http://diamondawardsonline.com. The 2009 SGN Scoops’ Diamond Awards have moved to a new location and date for this year. The awards presentation will take place at the inaugural Branson Gospel Music Convention. The show will take place on Thursday, July 16, 2009 in Branson, Missouri at the Branson Convention Center. The awards program will precede the Thursday evening concerts and will begin at 6:00 p.m.
Additional information concerning the 2009 SGN Scoops Diamond Awards, including hosts, sponsors, and performers, will be available shortly.